The great Yiddishist Leo Rosten was hopefully rolling (with laughter) in his grave last night. The late author of the book "The Joy of Yiddish" worked very hard during his lifetime to bring the dying Yiddish language into the mainstream. Last night's five minute dialogue between actor Jason Bateman and Jon Stewart included more Yiddish words than we typically hear on television. It was as if Bateman wanted to drop some of his well-rehearsed Yiddishisms during his interview on The Daily Show. 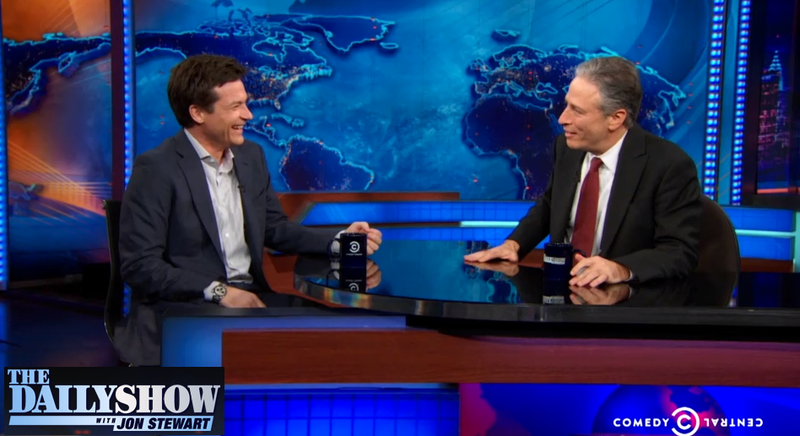 As soon as Jason Bateman sat down he told Jon Stewart that his "It's nice when nice happens to nice" opening comment sounded very Yiddish. And from there it became a Yiddish word competition between the two men. Jason Bateman explained that he recently learned the Yiddish word "chazerai" which seemed to confuse the Jewish host of The Daily Show (the former Jonathan Stuart Leibowitz) who mistakenly said the word means a guy who's a bit of a chazer (pig). Bateman correctly defined chazerai as garbage, but Stewart disagreed. At the end of the show Stewart actually returned to publicly apologize to Bateman for correcting his Yiddish since chazerai indeed does mean garbage. Zei gezunt to Jason Bateman and Jon Stewart... and thanks for the early freilich Purim gift! The word: hazerai- referring to unhealthy foods most probably derived from hazer- pig the quintessential non- kosher animal.A hazer is a derogatory name like חזיר in Hebrew what may explain JohnmStuart mistake. I always thought of chazerai as meaning pig slop, the kind of food you would feed to a pig, but when Jason Bateman defined it as "garbage," I agreed with that. When Stewart started correcting him, I cringed. It's not the first time I've seen Stewart's Jews Schmooze show his ignorance. I'm glad he was enough of a mensch to come back at the end and set the record straight. The only way someone can refer to the "dying Yiddish language" is if he has never been to New York or Jerusalem. Yiddish is alive and kicking among hundreds of thousands of Jews using it as an everyday first language and/or their daily academic study language. In large swaths of New York and Jerusalem you can walk in the streets and think you're in a Yiddish-speaking country. In-case you do not know, Jason Bateman is a VERY devout Christian, married to a Lebanese-Catholic, and his sister is just as religious--Justine. His "spitting" at the end is an obvious reference to the fact that it is customary for Israelis to spit when they pass a church and/or see an image of Jesus the Christ, or The Crucifix. Also, his reference to himself as a "typical goy" was especially biting, and it was truly amazing to see something like this exchange take-place on televiion.